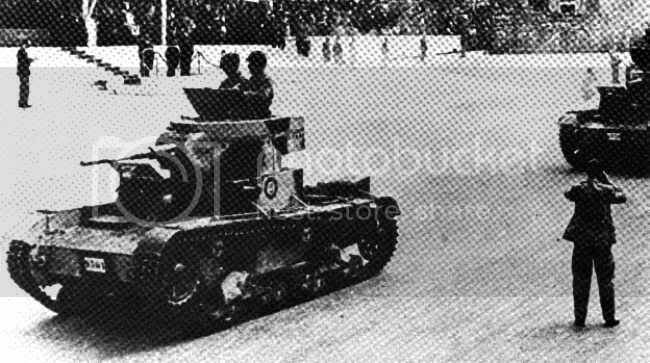 In a recent conversation with a modelist expert from Ankara, he told me that Turkish 1930s tanks rarely showed national markings --at most, a small plain red roundel on the sides. Given this, if you were to build a Turkish tanks unit, what kind of markings would you use for them? Red roundel with white crescent and star would look best for sure, so if I would find myself building such a unit for the wargames table then that most likely. I'm nearly certain that Armor Magazine #17 had a color drawing of a Turkish T-26. I don't have it anymore so I can't confirm. Squadron has it for $3 USD so you might take the chance. I would second Dom's sentiment. Don't ignore the aesthetic side of the hobby. Does somebody have more detailed info on the size and vehicles of the Turkish tank force in the 1930-1945 period? 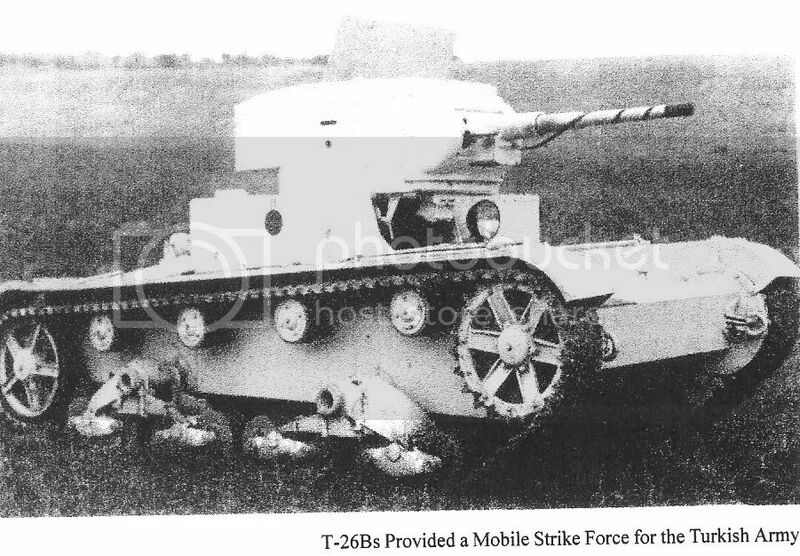 Very little info that I've come across, but here gives you a start – basically pre-war Soviet kit, with some German tanks donated in '43 as the Germans tried to get the Turks onside. maintenance would be "challenging" ! In 1943 two armoured brigades were founded in Nigde and Selimiye Barracks /Istanbul, the 1st Armoured Brigade at Davutpasa being re-named to 3rd Armoured Brigade. The new brigades were equipped with: 25 US M4 Sherman tanks, 220 M3 Stuart tanks, from the UK 180 Valentine yanks [sic] and 150 MK 6 light tanks as well as 60 Bren Universal Gun carrier vehicles were received. I wonder if they were diverted from the Lend-Lease shipments being sent via Iran? The pre-war Turkish armoured force was built around a contract with the Soviet Union that saw the delivery in 1935 of 60 T-26 model 1933 tanks, five T-27 tankettes and 60 BA-6 armoured cars. The outbreak of war caused France and Britain to court Turkey, and this resulted in the delivery of further small quantities of AFV's. France delivered 50 R-35 light infantry tanks in January 1940 and Britain 16 Mk VIB light tanks at the same time. Turkey's geographic location guaranteed that competition for her favour would continue. In September 1942 Churchill directed that tanks be made available in the form of 170 Stuarts and 200 Valentines. Deliveries began in November and continued through 1943. By the end of 1943 the Turks had also requested 500 Shermans to form two armoured divisions. By this time, however, Turkish indecision on entering the war, their receipt of weapons from Germany (22 PzKpfw III & 22 PzKpfw IVH), and a general shortage of armoured vehicles on the allied side had caused the British to lose their patience. Deliveries to Turkey were stopped in March 1944, by which time Turkey had received almost 400 Stuarts and Valentines, all tired vehicles from the Middle East and Persia/Iraq theatres and 34 Shermans that were no longer fit for service. Deliveries did not begin again until February 1945, when Turkey declared war on Germany. The Valentines, the most numerous tank in the inventory, were almost all 2pdr armed versions, with only a few Mk IX. " quite an eclectic collection of WW2 armor.